When you think of nightlights, you probably think of the crescent moon shaped plug-in that you had as a kid. When we get older, lamps replace nightlights forever, and it&apos;s so much harder to reach for knob on a lamp than it is to kick a nightlight out of the socket. Industrial design student Nicholas Baker created the perfect solution for adults who want a cool light so that they can read in bed (that&apos;s what adults do, right? ), but also something easy so they don&apos;t have to use any bodily energy to turn it off when the Sandman comes. 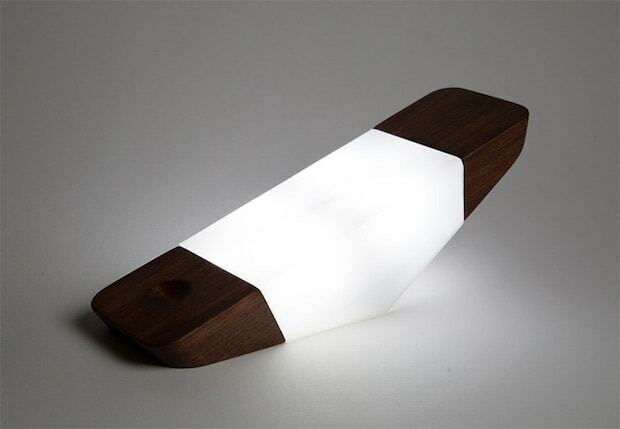 The Prism Nightlight is a rocker style light that seesaws from on to off. The product is so simple, yet so damn smart. It&apos;s still in the prototyping phase right now, but we definitely want this when it hits the market. For more about this cool toy light, head to Baker&apos;s Tumblr blog.